WOW...........I love them both...........almost impossible to choose between them. Thank you so much !! Well, here it is Labor Day and I promised to post Autumn avatars for you all! Hope you had a great summer and are enjoying the holiday. I'll be posting all the avatars that have been requested and the ones that I am relatively sure will be picked up. If yours is not posted and you'd like one, I'd be happy to make you one. Just leave me a post. I came up with three designs so far. Some blink, some have the inner wings sparkling, and some are framed. Take a look at them and see if you like any. If you want one that is not framed, but would prefer a frame on it, I'll be happy to frame it. Or make any adjustments you suggest. The first two have inner wings sparkling and they both blink. One is framed, one not. The first one has wings sparkling, and she blinks, second one, just wings sparkling, the third, no animation of the fairy. They are both dark blue, not sure which shade you prefer. The "UNTIL" is built in and can't be changed for use on this forum, so you need to have it say something that makes sense with that. Like UNTIL Justice Begins for Caylee, or something like that. If you can come up with something using "UNTIL" at the beginning, and it fits, I'll give you the code. I'm sorry! I just assumed the wording could be changed, and I can't think of a single way to use "Until", other than the one's you have already made! I must have missed this darker blue one This one will be perfect! It's a lot easier for me if I know what you wanted to represent you in an avatar. For now I'll see what I have in the way of monkeys that you might like. I just don't know your taste. If you like any of the above, you may use it. So glad you came by and saw these! I just finished winter and Christmas for you today. Be sure to come back and get those when I post them! Hey, Brandi, could you make me look like and autumn monkey? Thanks so much! For the first couple of designs, I made your eyes larger and made you blink. Your eyes are originally, quite squinted, and hard to tell if you are blinking, so I made them open just a wee bit more than in your original monkey. I also gave you each design with the original eyes, if you prefer them. I hope there is a design you like for Autumn. If not, let me know and I'll work on another for you. Oh, Brandi, you do so much! Thank you, I love the bigger eyes! I can't decide which one I like best, so I'm going to play around with changing them, (like Trimm does.) You are so sweet to do this for me. Here's to you! Thanks so much Ms Brandi! As always, you did a fantastic job and I love it. I think you missed 4th of July. Now be sure to come back for winter/Christmas! I have always enjoyed working with your monkey couple! Oh Brandi! what can I say -- I love the pastels of the autumn leaves and right now my Nordie is doing a lot of laying around outside. You captured him so perfectly. And yes, I did love that one from last year too! You are so attuned to him, it's awesome! Thank you for sharing your talents!! Blessings! Sorry I didn't reply to you sooner. (Or did I reply? LOL)I read your post right after you posted it and kept meaning to come back to reply to you, but I have been busy with new requests, while trying to keep ahead of the game at the same time! Your work is just amazing! The creations you make add so much warmth to all the threads..particularily Kyron's. I am currently using an angel avatar..but it just doesn't suit me anylonger ..now that I am a Monkey. When you have a chance could you possibly make me an avatar using a cute little monkey and a fall theme? No rush..just when you have the time. Thank you so much for the nice sentiments! What I think is cute, is not necessarily what another person thinks is cute. However, you may not find this chimp cute, nor like the effect I used by placing him into the avatar. So, if you like this one, please use it. 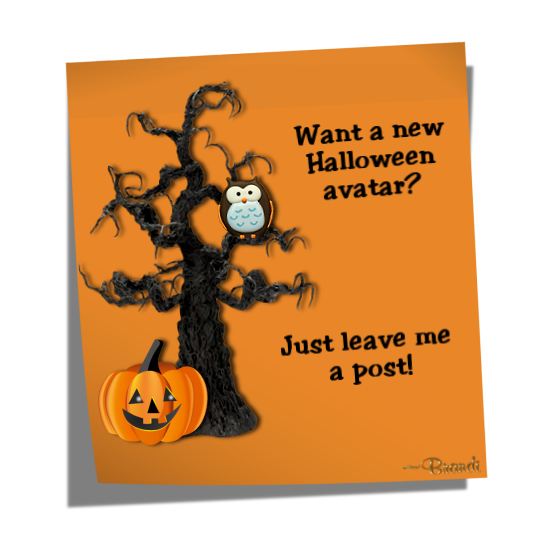 If you do not like it, help me by finding a monkey you like and I'll make an Autumn avatar with it in it. Hello! Just checking out your work. How cute is that little monkey. Oh Brandi..he is adorable..and I love the fall background! I am using the first one of the two. Thank you so much..I feel like a true Monkey now.